LIBERAL, Kan. – The Seward County volleyball team continues their historic season moving up to third place in the final NJCAA Division 1 poll. The ranking ties the highest the Lady Saints have ever been ranked. The Lady Saints increased one spot in the poll following a week which featured a sweep against Butler and a 3-1 win over Barton. 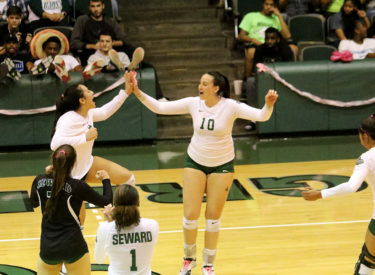 The Lady Saints are currently on a 15-game winning streak dating back to September 16 and have also won 24 straight Jayhawk West matchups, dating back to October 12, 2016. Seward will finish the regular season with two home matches this week, starting with a match against third place Colby on Wednesday at 6:30 p.m., before finishing the regular season with a matchup against second place Hutchinson on Saturday at 6:30 p.m. for Sophomore Night.